Dina is another one of my most favorite people on the entire planet, and she just happens to be a fabulous cook. Every time I stop over for a visit, we inevitably wind up talking about food and whatever new recipes we've tried and cooking shows and such. 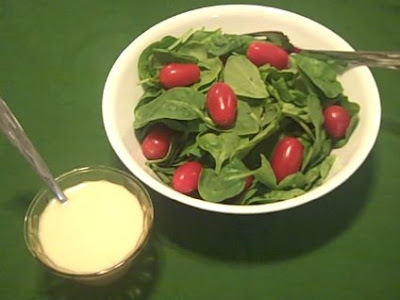 She recently made this vinaigrette for Tricia's bridal shower and it was a big hit. I'm so glad she shared it with me! Thanx Dina! whisk in the oil. Season with more salt and pepper to taste. When I made it, I didn't have the exact ingredients, but I used what I had on hand and it all worked. I used regular vegetable oil instead of olive oil. I used half cider vinegar and half white vinegar. And I doubled the amount of honey, just because I like a sweeter dressing. My friend, Paul, loved it so much he said he wanted to bathe in it. It's THAT good!!!! Not only did i wanna bathe in it, i was literally drinking it right from the serving dish it was in!! DEEEEEEElicious! !